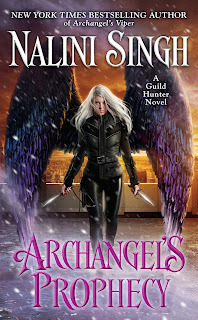 Archangel’s Prophecy is the latest installment in the story of Raphael, the Archangel of New York, and Guild Hunter Elena Devereaux. The story opens with ominous signs, odd behavior from birds, a lava sinkhole in the Catskills, and an unfamiliar voice in Elena’s mind warning that she must die. The Cascade, the uncontrolled power that changes angels and archangels, is surging. On top of that, her angelic abilities are fading. She suddenly has difficulty flying, injuring herself performing a maneuver she mastered long ago. Other physical problems manifest, and the angelic healers can’t explain why. They think her problems may be due to her unique situation as an angel Made by the ambrosia Raphael fed her as they fell from the sky over New York with Elena mortally wounded. Legends of angels of such making are ancient, but no one can find any records. Meanwhile, the physical changes and problems are accelerating. The events of the Cascade claim much of Raphael’s attention, and he is also manifesting strange new abilities. Elena worries that he’ll change so much that he’ll lose the bit of humanity loving her has given him, that he’ll become cold and remote and completely other. He grows increasingly concerned and frustrated by the changes in her and the lack of information and solutions. As though all that weren’t enough, developments in China, the former domain of the megalomaniac archangel, Lijuan, hint that she may be causing trouble even though she is supposed to be deep in angelic Sleep. Against the background of all these worries, Elena pursues the unknown assailant who almost killed her newly-Made-vampire brother-in-law. The investigation leads her to the murders of other vampires, acquaintances of his, that are apparently motivated by vengeance. The deterioration in her immortality accelerates, but she’s determined to solve this case before the mysterious assailant makes good his threat to kill her sister and niece. A confrontation with the killer brings the changes in Elena to a crisis point. Desperate to save her, Raphael makes a drastic choice that endangers his life. This is a powerful and wrenching story, clearly leading to a new phase in Elena and Raphael’s love. Although the ending is a cliffhanger in that we don’t know the result of Raphael’s choice, a bit leading into the end offers reassurance. Some readers will find that more satisfying than others. Those who dislike cliffhangers in all their forms may want to wait and read Archangel’s Prophecy back to back with the next book. Those who just want to see what happens to this beloved pair and are fine with not knowing the details will not be disappointed. I'll wait. I don't like cliffhangers. I loved this book! 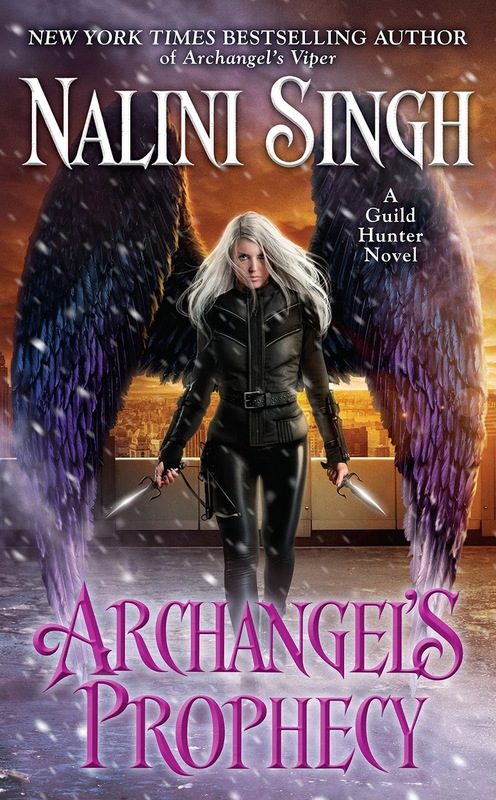 Like all Nalini books, you can feel the emotions of the characters and they are all so... I don't know, it's amazing. Thanks, Alina! Obviously, I loved the book.